During a very lengthy career (she published her first book in 1951), Calisher has produced a number of novels, several story collections, and a significant number of novellas. 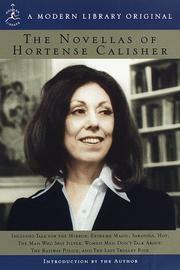 Seven have been assembled for this volume (including the previously unpublished "Women Men Don't Talk About"), and they demonstrate how deftly Calisher has made use of the form, which she describes as being "not merely a shorter novel, of less wordage than commonly," but a more focused version of the novel, "tenaciously complete." The tales gathered here demonstrate many of Calisher's virtues as a writer: her ability to capture odd, disturbing characters (Dr. Bhatta, in "Tale for the Mirror"); her sensitive and often quite original exploration of the struggle of modern women for an independent identity ("The Railway Police"); her bemused exploration of the half-submerged American ideas of class ("Extreme Magic"); and her rather harsh but convincing portraits of marriage ("Saratoga, Hot"). Varied, precise work by a writer deserving more attention.